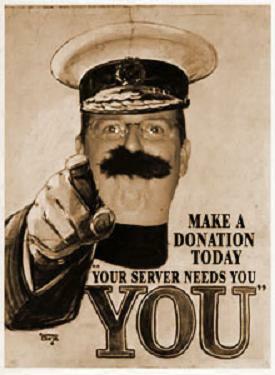 [fP] Servers are made possible through generous donations from our members and staff. If you would like to help us out, any and all contributions would be greatly appreciated. Thank you! Leave us a quick message after the beep.. beeeeep! and is now 32 years old. and is now 29 years old. and is now 38 years old. and is now 45 years old. and is now 48 years old. and is now 33 years old. and is now 62 years old. and is now 49 years old. and is now 40 years old. and is now 37 years old. and is now 51 years old. and is now 30 years old. and is now 31 years old. and is now 36 years old. Massive thank you to those who have responded and helped out with server costs. You have made a difference. Lots of people helping makes a huge difference, please continue as small donations add up! We have been happily providing ET & other format servers for getting on 10 years now but the as of late the server contributions from members and non members have been drying up. We are getting towards a situation when the usual suspects aka 'cash cows' are getting barren. Unless contributions increase in the next couple of months we will have no other option than to close our servers for good. As has always been said..lots of people with small contributions goes a long long way but unfortunately it has been few people with high contributions recently. The choice is yours...any contribution no matter how small makes a difference. Many thanks to all the contributors who have worked to keep ET alive!! Merry Xmas All from the [fP] Team !! This mod gives all six standard-maps a new look (Radar contains only detail-changes). The pk3's include only the needed files, no bloat or scripts are included. Put the files "z_european-style_fd+rg.pk3" and "z_european-style_sb+so+gr+wr.pk3" into the etmain folder. To uninstall this mod remove the pk3's. Only the textures will be changed, the gameplay of the maps itself is not affected! The mod is server-sided, this means if the gameserver is running this mod (or it's an unpure-server) every player who installed the pk3's into the etmain-folder will see the changes - others not.